Eucerin DermoPURIFYER Toner is to be applied daily as part of a cleanse, clear and care routine. Its anti-bacterial formula contains 2% Lactic Acid active system which gently unclogs pores without overdrying, reduces the growth of bacteria (one of the four factors of impure skin) and prevents blemishes. It is particularly effective in the T-Zones and can be used alongside common acne medication. A placebo-controlled study carried out on ninety 16-46 year old men and women and female candidates with acne vulgaris, was conducted over three-months in 1999. The study aimed to understand the efficacy of Eucerin DermoPURIFYER Cleanser, Toner and Night Care. Between June 2000 and July 2002 1033 (median age of 21) patients with acne vulgaris took part in a six-week programme conducted in Germany, Austria, Belgium and Thailand. The products tested were Eucerin DermoPURIFYER Cleanser, Toner and Night Care. Clinical and dermatological studies showed excellent skin tolerability and efficacy on patients with blemished and acne-prone skin. Assessment of the disability index revealed that the wellbeing of the subjects increased significantly. The Eucerin products proved to be tolerated by nearly all patients. The typical acne-related problems improved. The candidate's assessment othe safety of the products patients was, for most, "good" or "very good." Then use Eucerin DermoPURIFYER Toner, which prepares skin for the following care. For best results also use the Eucerin DermoPURIFYER Night Care, Scrub and Concentrate. If sun exposure is expected, apply Eucerin Sun Fluid Mattifying 50+ after applying care. Eucerin DermoPURIFYER Toner is oil-free and suitable for impure skin due to its gentle action. You are a man whose skin is prone to sensitivity after shaving. The facial toner can be used instead of an aftershave. The Eucerin DermatoCLEAN Clarifying Toner cleanses deeply whilst maintaining the skin´s moisture level. Acne is not a sign of poor bodily hygiene. On the contrary: too frequent cleansing of the skin with aggressive cleansing products can irritate the skin even more. Nevertheless, you should take care to cleanse your skin twice daily with a mild, nondehydrating facial cleanser in order to remove excess sebum, sweat and dead skin cells from the skin. One should, in any case, avoid "fiddling around" with your fingers on the acne symptoms. Acne is not an allergic reaction to particular foods or external stimulation. Allergies manifest themselves characteristically in different ways and can thus be clearly identified as such. Will my acne clear up as I grow older? Usually the acne-related problems reduce with age. Although, some patients suffer from acne also after the age of 30. If you do not see an improvement, please contact a dermatologist. I have been using Eucerin DermoPURIFYER Toner for several days but my skin is still blemished. What am I doing wrong? Blemished skin can recover, but not overnight.Be patient. Persevere with your cleanse, clear and care routine and you will start to see improvements in your skin's condition. Can I use Eucerin DermoPURIFYER Toner on my back? Yes. Acne-related problems on your back are treated exactly the same way as on your face. Yes. Genetic predisposition plays a large part in acne. If both parents suffered from acne during their adolescence, then there is a greater likelihood that their children will also develop acne. 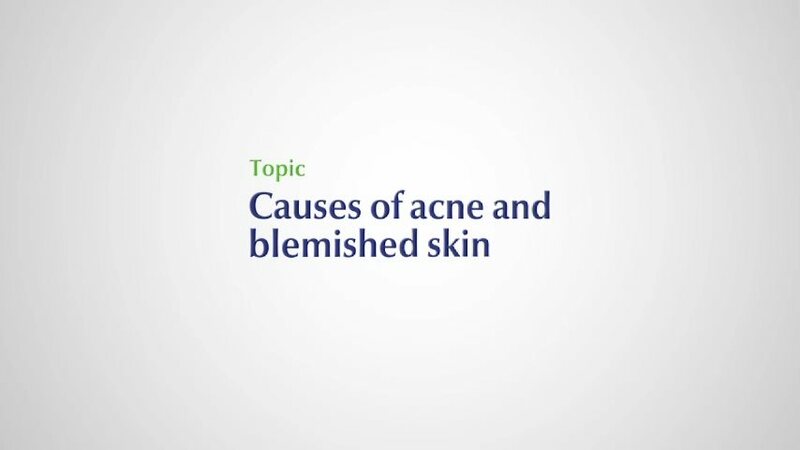 Dr Simone Presto, a medical doctor for Eucerin, explains the role of the four factors of acne.